Taking the bus wasn’t an alternative, so Nicloe did the best she could to get her son down the street to Lincoln Elementary School, but he arrived a few minutes late. Hunter rushed into the school crying, the poor boy knew he would face detention. Nicole felt really bad about all this, but she decided she would go to the school at lunchtime to check on him and lift his spirits if she could. His mom Nicole decided to visit his school during lunch. What she saw stunned her. Her son was separated from the rest of the students as a punishment being put through what many would agree was a public humiliation. Hunter was sitting alone when his mom arrived at the school. 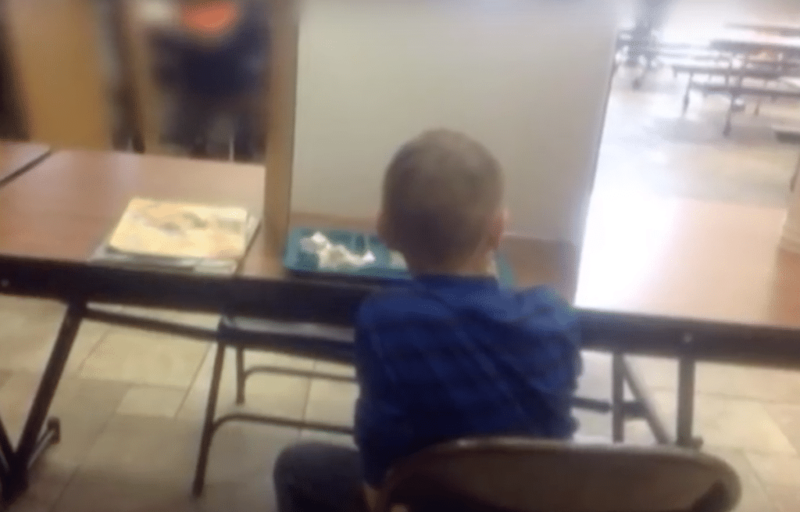 She was stunned to find her son separated off from the other children in the school. 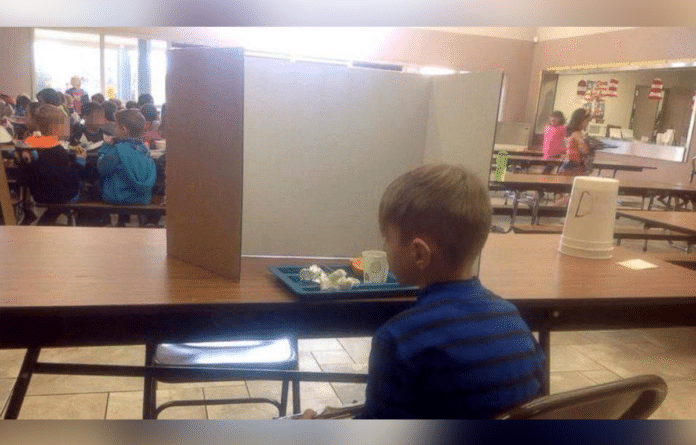 The 6-year-old sat with a white partition in front of him, blocking him from seeing or communicating with other kids. There was also a cup with “D” on it in front of him (for detention), whilst Hunter himself sat in tears. Hunter was publicly humiliated and naturally his mom Nicole was outraged with the school’s treatment of her son. The punishment seemed far too severe. Her son was rarely ever late to school, and hadn’t been late enough that day to make up any assignments. The mother could hardly believe her eyes, but she wasn’t about to let what happened to her son go unnoticed. Nicole decided to take a picture of Hunter as he sat in his cubicle of shame. Later she uploaded it to Facebook, where it quickly sparked a fire within the local community. It appeared that the school’s policy had bullied Hunter. The school district was flooded with furious calls and the school’s Facebook page was bombarded with bad reviews. Once the pictures went viral, others in Grants Pass wanted to help. They made it their mission to ensure Hunter was never late to school again – strangers had come together to help them with their car problems. When Hunter’s mom and dad showed up to pick up their car from the repair shop, they got the surprise of their lives. Nicole and her family turned up at Kelly’s Automotive Service a few days later expecting to be told that their car was beyond fixing. Hunter’s father, Mark Cmelo, expected to receive more bad news about the car. However it was quite the opposite. The car dealer had joined forces with people in the community to buy them another vehicle and make sure it would be dependable. Several businesses in Medford, Oregon, and Grants Pass, as well as a local radio host, Bill Meyer, joined forces to chip in. Nicole and her family was then handed the keys to a Chrysler van. “You see that minivan sitting right there?” asked Lisa McClease-Kelly of Kelly’s Automotive Service. “That’s yours,” she said, as she handed Marc the keys to a Chrysler minivan. The family was both shocked and moved. “I’m just blown away to see the community come together like this and see that there’s still good people out there,” said the happy father, Marc. Hunter’s story changed the way the school handled their detention policies.They designated a supervised classroom so kids wouldn’t be shamed in front of all their schoolmates. Previous Story Previous post: Vietnam vet soils his pants at Kroger, employees surround him when woman does something.